Schwartz & Wade, 9780449810163, 40pp. 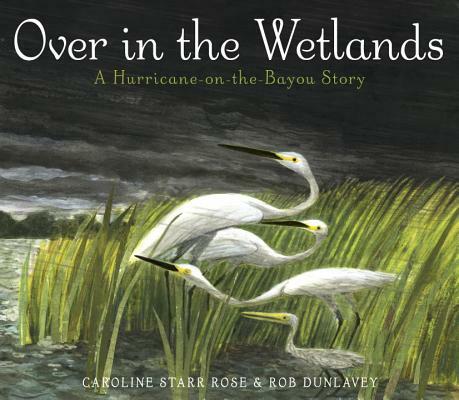 Publishing in time for the tenth anniversary of Hurricane Katrina, here is a beautiful read-aloud about animal families preparing for an impending storm in their bayou habitat. Journey to the Louisiana wetlands and watch as all the animals of the bayou experience one of nature’s most dramatic and awe-inspiring events: a hurricane. The animals prepare—swimming for safer seas, finding cover in dens, and nestling their young close to protect them. During the height of the storm, even the trees react, cracking and moaning in the wind. At last, the hurricane yawns and rests, and animals come out to explore their world anew. Caroline Starr Rose was named a Publishers Weekly Flying Start Author for her debut novel, May B., which was an ALA-ALSC Notable Children’s Book and received two starred reviews. She spent her childhood in the deserts of Saudi Arabia and New Mexico, camping by the Red Sea in one and eating red chile in the other. She has taught social studies and English, and worked to instill in her students a passion for books, an enthusiasm for experimenting with words, and a curiosity about the past. She lives in New Mexico. Visit her at carolinestarrrose.com. Rob Dunlavey is the illustrator of The Dandelion’s Tale by Kevin Sheehan, which was called “luminous” and “radiant” in a starred review by Kirkus Reviews, and Counting Crows by Kathi Appelt. His work has been featured in the New York Times, the Boston Globe, and BusinessWeek, among many other publications. Rob has made murals for children’s museums in Miami, Florida, and Bridgehampton, New York, and in the East Hampton Public Library on Long Island. He lives in suburban Boston with his wife, two daughters, two insane cats, and a tropical fish named Bruce. Learn more at robd.com.